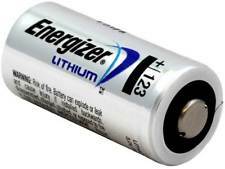 Home > Lithium Primary > CR123A : 3-Volt Lithium Primary battery. For cameras, flashlights, memory, etc. CR123A :3-volt Lithium primary battery (non-rechargeable). Size: 33.8mm long x 16mm diameter (1.5" x 0.67"). Fits in cameras, mini flashlights, memory, etc. Premium-quality. New stock is ENERGIZER brand.